Time for a new Quilt-Along! I didn’t host a formal quilt-along all this year because “Hazel’s Diary”, the Kansas City Star Block-of-the-Month quilt, was being presented each month. But with the final installment of “Hazel’s Diary” coming out in a couple weeks, it’ll be all finished, so I’ve decided to begin the next one. We’re going to begin with a series of easy tutorials on various ways to make half-square triangle units. Some of these methods you’ll recognize well. Some may be new to you. As we go, I’ll offer up my best tips and tricks for making them as easily and precisely as possible. I’ll also be offering suggestions on how you can decide which method might work best for any particular piecing situation you’re faced with on future projects. You’ll have skillz in your toolbox to pull out whenever you need them! Once we’ve gone through all the tutorials, we’ll start making blocks with all the half-square triangle units we’ve made. At the end, you’ll have a completed lap-sized quilt top, measuring 56″ x 66″. I do realize it’s the holiday season, so if you’re too busy to join in right now, don’t worry — these tutorials will be staying right here, and you can jump in any time. And, too, you can simply try the tutorials at your leisure, just to learn each technique, and you don’t even have to make the quilt if you don’t want to. Today I’m going to give you the list of fabrics and supplies you’ll need for the Quilt-Along, and at the end of this post, I’ll outline the 12-week posting schedule. I’ll also put links to all the posts for this Quilt-Along in the sidebar to the right, so just scroll down to the “Triangle Salad” section and you can find quick links to any of the related posts as we progress. 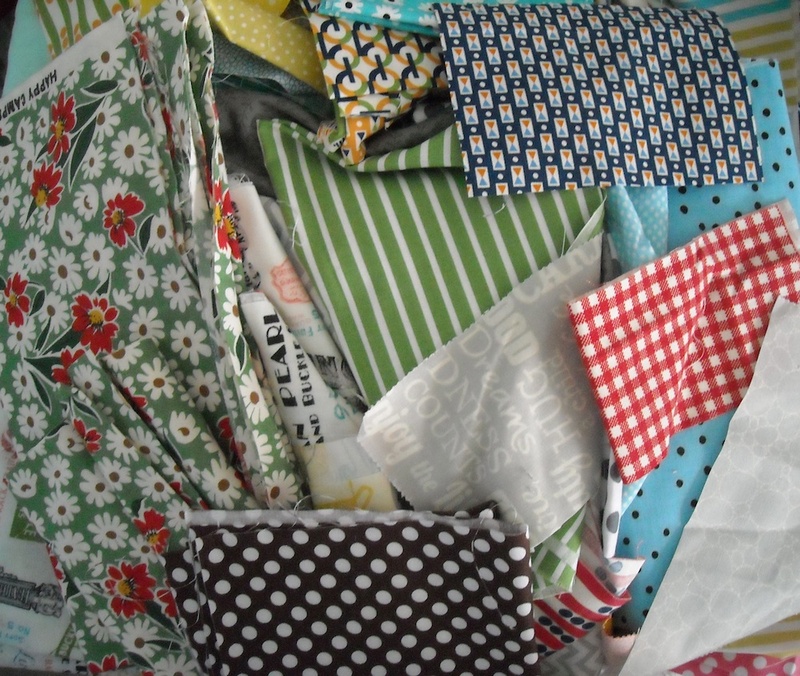 An assortment of scraps to equal 3 yards. I’m using up leftovers from some other projects. The more variety the better. You’ll need some pieces as large as 10″ x 10″ sometimes, and sometimes a 2 1/2″ strip will suffice, so just grab a motley mix of scraps in your favorite colors, and you’ll be good to go. Here’s a small sampling of some of the fabrics I’ll be using. My quilt is going to look very scrappy and bright! I’ll be adding in lots of other prints as I go — I like a wide variety in my scrap quilts. Background fabric: 2 1/2 yards. I’m using solid white, but feel free to use something else if you wish. You want this fabric to contrast well with your prints, so that they show up nicely against it, so keep that in mind when making your decision. A bunch of scrappy low-volume prints would also work great! Of course, we’ll need backing and batting later on, and a binding fabric. I’m planning to make my binding a scrappy binding, so no yardage is necessary for me. However, if you wish to make your binding from only one fabric, you’ll need 1/2 yard. If you are only trying out the tutorials, and don’t intend to make the quilt, any old scraps will do. I’ll be giving the sizes and cutting for those at the time each tutorial is posted. Pins, scissors, and hopefully not, but possibly a seam ripper! I’ve created a sheet of labels for you to use to label things and keep them organized as we go along. You can download it HERE. *If you do not wish to purchase an entire package of each type of the above-mentioned triangle papers simply to try them out, I’ve created supply kits that contain enough of each type of paper to create this quilt, along with the ziplock bags and pre-printed label sheets. That way, you don’t have to separately find each item yourself — you can just purchase the supply kit, and you’ll be all set for the quilt-along. You’ll still have to supply all the other goodies your ownself, though! Should you decide later on that you really like a particular method using the papers, then you can purchase only the type you need, and in the size you’re planning to use. No one wants to be stuck with something that doesn’t suit them, right? 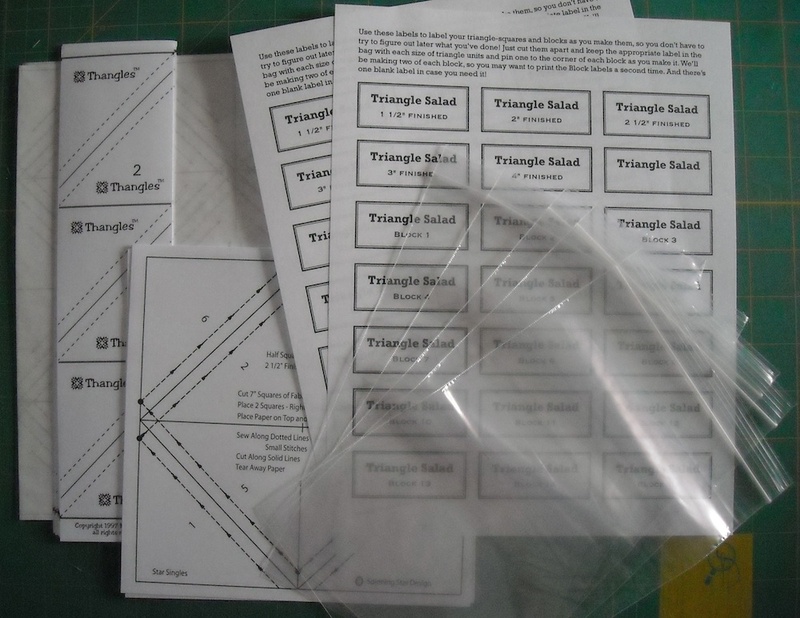 You can purchase the Triangle Salad Supply Kit in my Etsy shop HERE. Click on the Quilting Supplies category to find the listing. The first tutorial will be posted Monday, December 14th, so this gives you a week to gather your fabrics and supplies. The first tutorial does not use any of the triangle papers, so you have a little extra time to get those, especially if you have to wait for them to arrive by mail, so no worries there. That’s it for now. Please leave a comment or contact me if you feel something is unclear, or if you have any questions. I’ll be happy to answer. Count me in. I don’t have the triangles on a roll but trust I’ll be able to get them or do without. Looking forward to the fun. Hmm…what colors shall I use? Shelly, received my kit for the Triangle Salad quilt. Can’t wait to start my first quilt for 2016…and who better to start it with than you my talented friend. Is there a picture of the finished quilt? This time I am going to play along!